Many types of glues and adhesives are necessary for constructing model aircraft. Some are strong, some are brittle, some dry quickly, some slowly etc. This vinyl based glue is widely used. It gives a very strong bond when gluing wood to wood. This glue is cheap and ONE OF THE FEW NON-TOXIC adhesives around. It has, however two drawbacks. 1) It dries comparatively slowly and 2) may be slightly rubbery and thus difficult to sand. A new type of glue called Aliphatic glue looks identical to carpenter’s glue, but with a slightly yellowish tint. It is said to overcome the drawbacks of white glue. I have used Aliphatic glue a few times, and don’t see a huge difference between the two, though. This “super-glue” hardens in just a few seconds. “Cyano”, as it is regularly called, bonds when air is removed, i.e. when two pieces of wood are held together. Needless to say, the pieces that are glued together must fit very well, for the air to get squeezed out. Some people get allergic to the cyano fumes (myself included) so make sure you have proper ventilation when using this type of glue. Do NOT use cyanoacrylate on surfaces that you intend to solder, or otherwise heat up. The fumes are nasty. 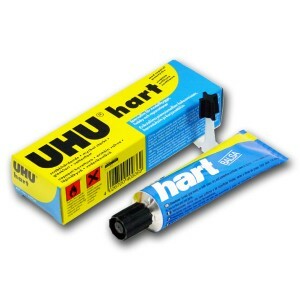 The most common cellulose-based glue is UHU Hart. It is easy to apply and works well on balsa. It glues faster than white glue, but slower than cyano. Cellulose based glue is not used as much now as it used to. Although I have heard that this glue is good for attaching litho-plate, I always get poor results from this kind of glue, and I really dislike it. Epoxy glue is a two-component glue. The two components must be mixed before it can be applied. The curing time depends on the brand and type of epoxy. Epoxy is extremely strong, and glues most materials (with the exception nylon). Several types of epoxy glues are available – some are even called “liquid metal”. Epoxy is a fantastic glue, but it is very heavy and does not sand well. Epoxy is also used when glassing the fuselage with fibreglass. The best source of epoxy glue is without doubt ship-building shops. Epoxy is poisonous and develops heat when mixed. Do not mix too big batches at a time. Epoxy also absorbs through the skin, so you MUST ensure proper ventilation when using it, and remember to wear rubber gloves.